Residential Air Duct Cleaning – When you’re in your home, you want to be confident you’re in a health-promoting and enjoyable environment – but are you? Clean Air America works hard to expertly clean residential air ducts so that families in Solon, Bentleyville, Reminderville, Glenwillow, Oakwood, Chagrin Falls, Warrensville Heights, Moreland Hills, Highland Hills, South Russell, and beyond can breathe better and avoid exposure to allergens and contaminants commonly found in residential air duct systems. Unlike many other air duct companies, we use expert equipment, including powerful Power Vacuum Trucks, to ensure that we’re safely and effectively removing contaminants from your air ducts and home. Our Power Vacuum Trucks are anywhere from 4 to 10 times more powerful than the portable and truck-mounted vacuums commonly used by our competitors. 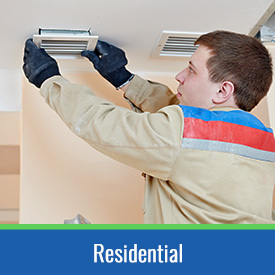 Learn more about our residential air duct cleaning services here! Commercial Air Duct Cleaning – Here at Clean Air America, we also work hard to keep the air duct systems of our local businesses and offices as clean as possible! With cleaner air, your employees will enjoy a healthier, more productive work environment and less respiratory health issues. Not only does commercial air duct cleaning improve the quality of your business’s air, but it also improves the efficiency of your heating and cooling system! With both cleaner air and lower energy bills, commercial air duct cleaning is a win/win for your business. Click here to learn more about our commercial air duct cleaning services. We also offer Ultraviolet Germicidal Light Air Purification Systems, which are designed to be installed in your HVAC system to capture and kill bacteria, viruses, odors, and other nasty particles. Our goal is to help you keep your air ducts and indoor air clean with minimal maintenance! Call Clean Air America Today! Whether your home or office is located off of Route 422, Bainbridge Rd, Liberty Rd, Som Center Rd, Aurora Rd, Solon Rd, or somewhere else in the area, we hope you’ll call on Clean Air America for honest, ethical, thorough, and effective air duct cleaning services. Wherever you live in the 44139, you can count on us when you need quality services! Call today for scheduling! We also bring the best Dryer Vent Services to the greater Solon, OH area. Learn more here! We keep the respiratory systems strong in residents of Strongsville with our expert indoor air quality services in this area or our service region.